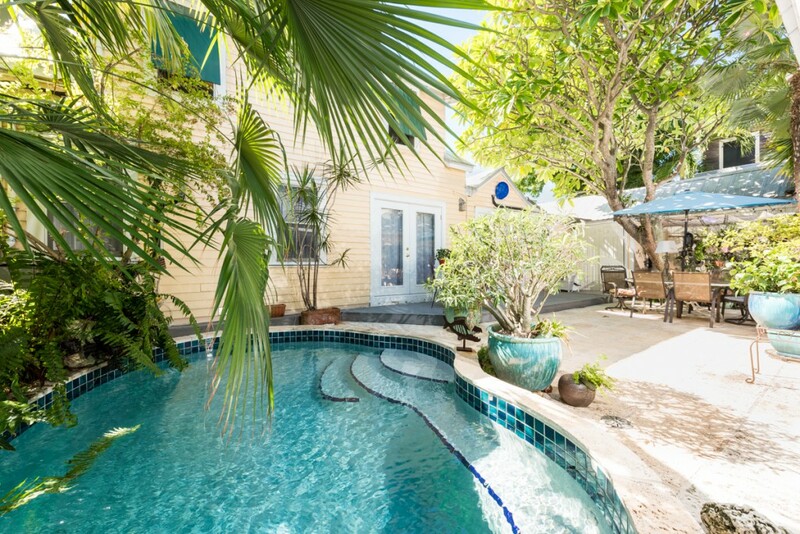 915 Cornish Lane, Key West, FL—SOLD $1,125,000. Every once in a while, a home comes on the market that totally knocks our socks—or should we say underwear—off. 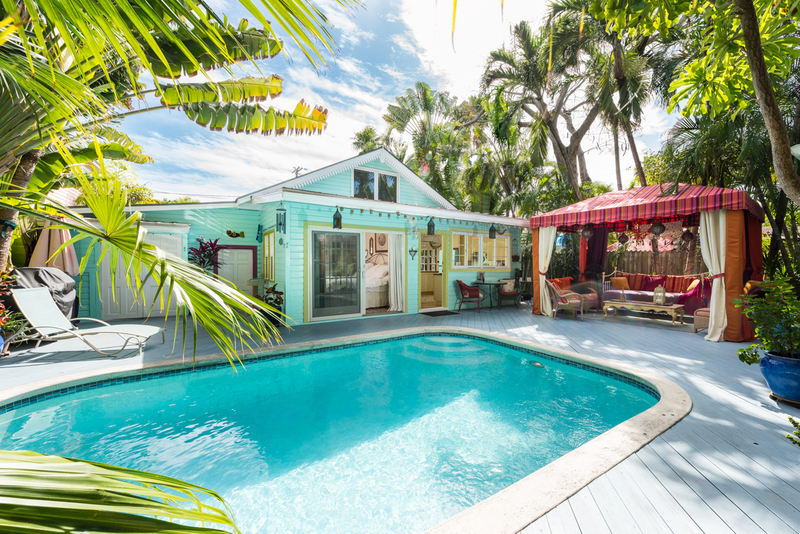 Celebrity fashion designer Andrew Christian ‘s sleek and stylish, Key West vacation home is one such masterpiece. 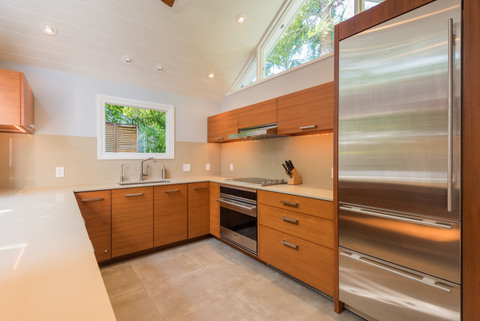 The stunning, 2 bedroom/1.5 bath, contemporary cottage has been lovingly and meticulously renovated. No detail was overlooked. Fans of our blog, Our Key West, know that we are enamored with the tucked away cottages of Key West’s hidden lanes. 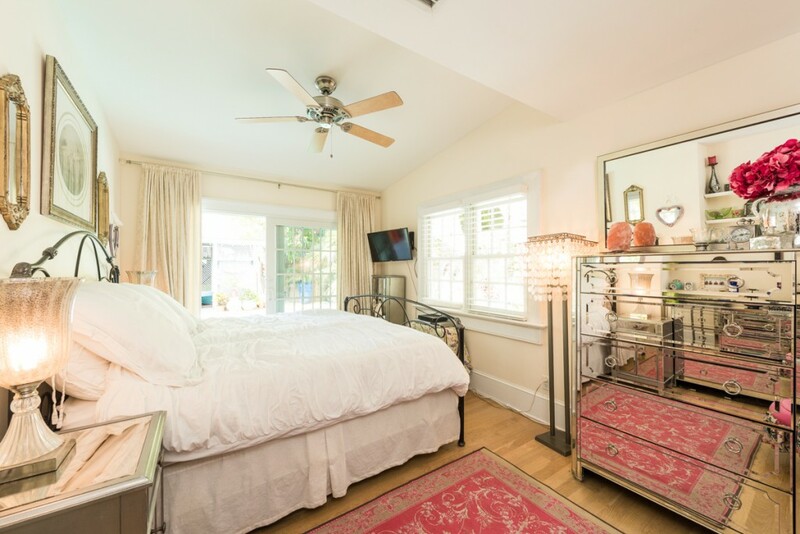 Nestled at the end of a quaint and quiet lane off Grinnell Street (between Fleming and Southard Streets), 915 Cornish Lane offers privacy and seclusion in the heart of Old Town. Entering the front gate, you are captured by the rich Ipe hardwood decking gracing the cloistered front porch. High ceilings, walnut floors, and views of the pool greet you as you move into the home. The bright and sunny living/dining room is beautifully appointed with designer furnishings and modern built-ins. The light-filled kitchen is a chef’s dream. Along with Viking and Subzero appliances, Custom cabinets and Caesarstone counters grace the modern, streamlined kitchen. The convenient pass through window makes outdoor entertaining a breeze. 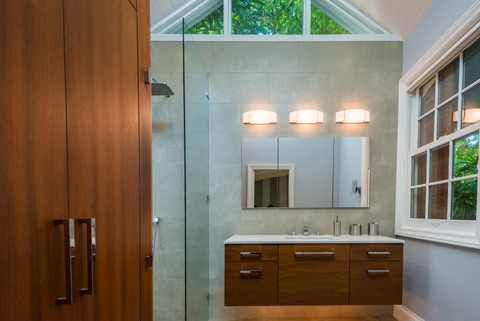 The in vogue master bedroom opens to the outdoor showers and the exquisitely designed master bath. Mirroring the kitchen, the bathroom’s wood cabinets and Caesarstone countertops are bathed in light from beautiful gable windows. The shining guestroom sports a custom designed closet to die for. Perfect for intimate entertaining, the home’s tropical outdoor living space is a sea of tranquility. The sparkling pool is heated for your enjoyment. 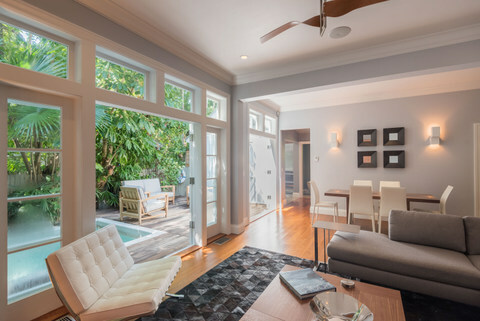 The garden living room is the perfect spot to relax and enjoy the best of island living—paradise in your own backyard. 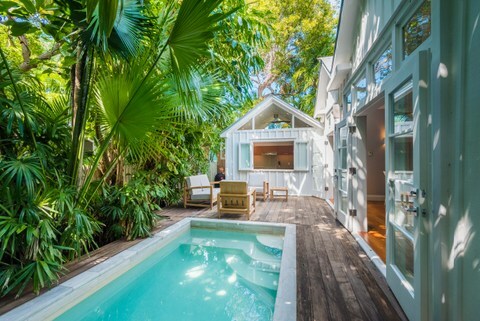 We wish we were writing a check for this extraordinary Key West cottage. Click here to visit Andrew Christian’s website. Click here to enjoy a virtual tour of this spectacular contemporary cottage. 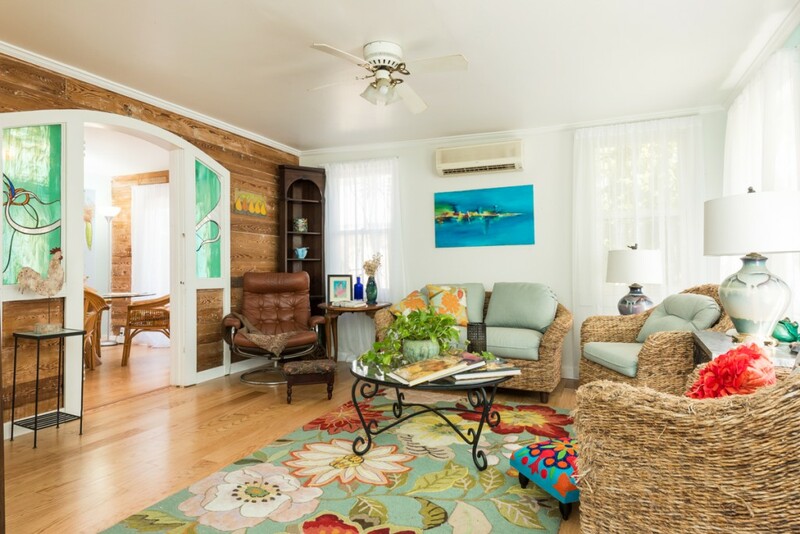 This entry was posted in Homes We Love and tagged cottage style, homes, Key West, Key West cottage style, key west real estate, Old Key West, Old Town, real estate on February 29, 2016 by Dean. 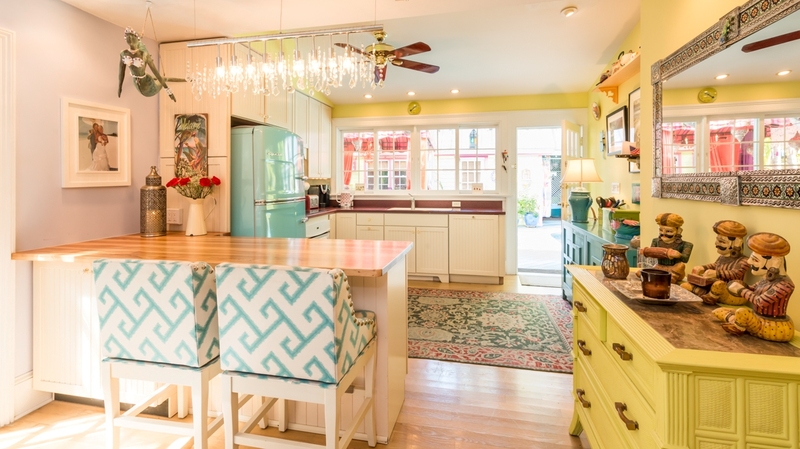 1113 Curry Lane, Key West, FL—SOLD $790,000. 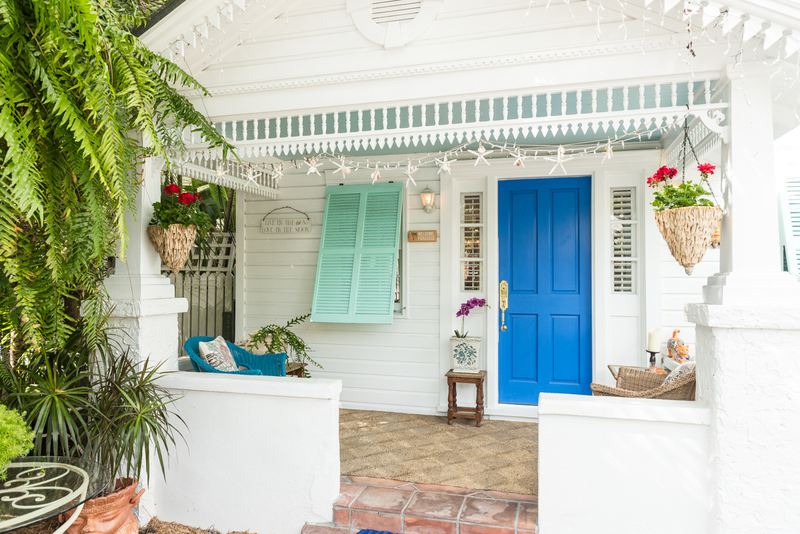 We have always dreamed of finding a charming Key West cottage, tucked away on one of Old Town’s hidden lanes. Something a little old Key West funky, that we could put our stamp on, would be perfect. If it had a private garden, pool, and guesthouse, all the better. The home at 1113 Curry Lane—a secluded lane that runs between White and Frances Streets—is the stuff that dreams are made of. The two bedroom/two bath main house captured our hearts at first glance. 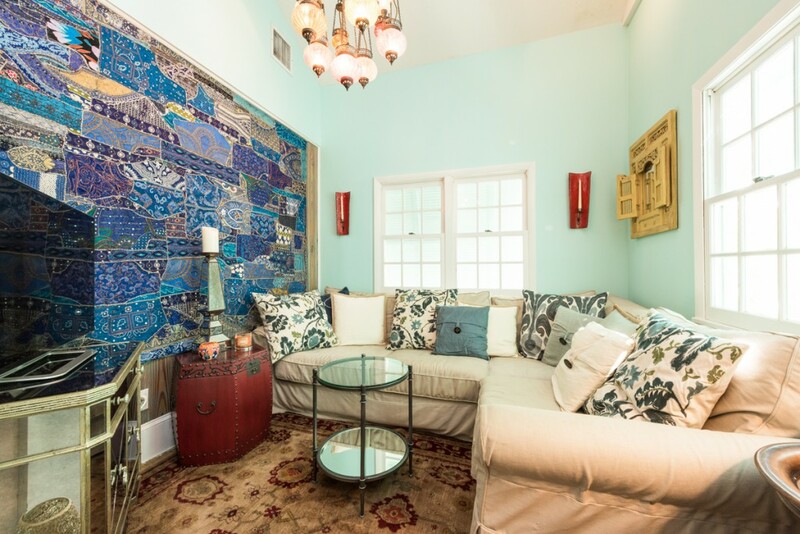 We love the light-filled, eclectic living room with its Dade County pine accent wall with stained glass panels. The dining room opens to the beautifully updated kitchen with a vaulted, trompe-l’oeil ceiling, and French doors that open to the garden. A guest room and a full bath finish off the main level of the home. 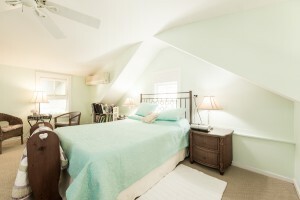 The Upstairs offers a spacious master bedroom with a dressing room and full bath. Three quiet and efficient, ductless air conditioning systems cool the structure. We love the home’s private tropical courtyard. The sparkling, solar heated pool catches plenty of sun. Overlooking the pool and garden, the separate guest cottage has its own bath. Visitors will love it, or it can be legally rented for extra income. 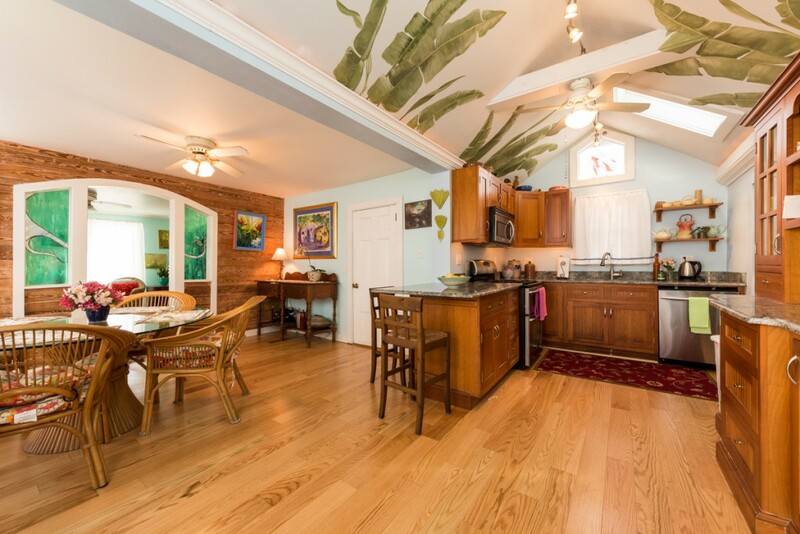 With great bones, tons of charm, and just the right amount of Key West spice, 1113 Curry Lane is ready for you to make it your own. We wish we were buying this wonderful, secluded gem. 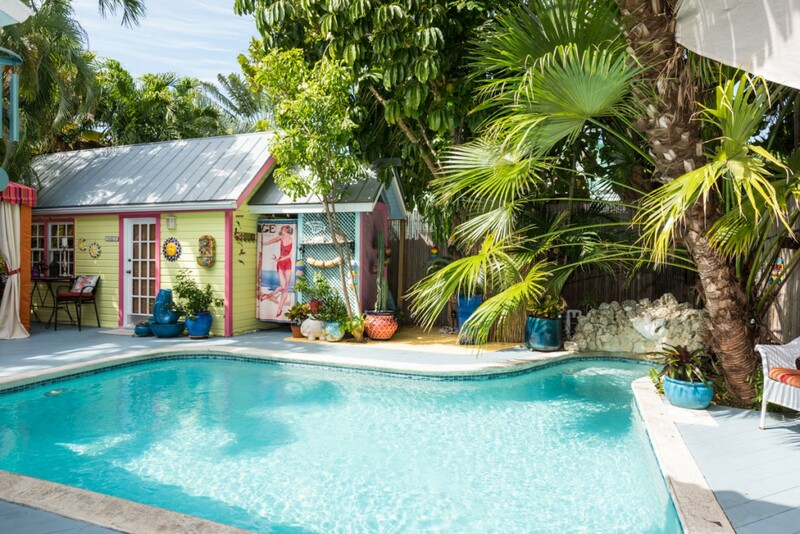 Click here to enjoy a virtual tour of this charming Key West cottage. 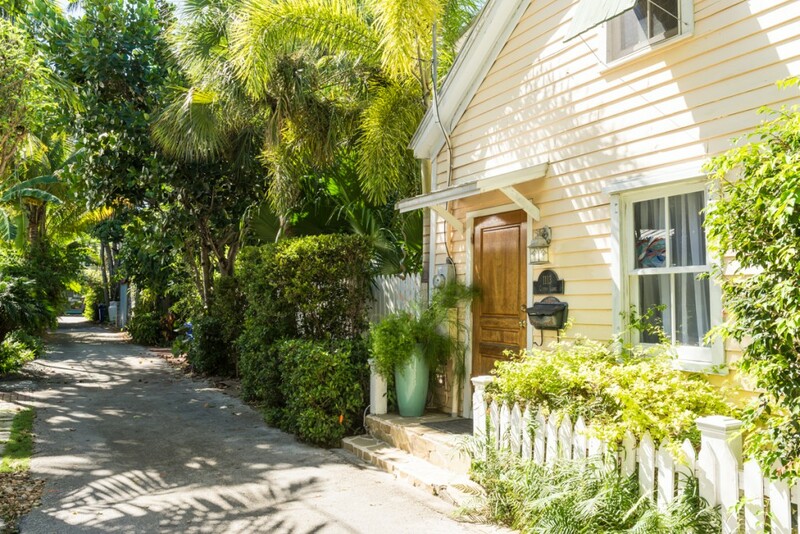 This entry was posted in Homes We Love and tagged cottage style, hidden lanes, homes, Key West, Key West cottage style, key west real estate, Old Key West, Old Town, real estate, tropical gardens on February 24, 2016 by Dean.